Click on image to enlarge for a crisp view. I do wonder about the AirAsiaX order of 34 A339 though. Airbus says it’s a firm order and was placed during Farnborough. I always wonder about Air Asia. I never trusted their first 9 incarnations. And now they have a 100 A330NEO on order, pheweee. Now lets see what the delivery schedule actually amounts to. We will take the 100th A330NEO in 2050?. Looks like the B-boys are quite aggrieved that AirAsia X not only decided to stick with the A330-900, but that the airline also had the sheer tenacity to order another 34 airframes. I think the “B-boys” are pretty happy with this show and 2018 overall thus far! Yep, they kept a Blue Chip customer with Air Asia and let them off the financial hook for other stuff. And added 34 more to an order that Air Asia has been mucking around with and kicking orders down the runway. Sure they will take a few, then, oh, we need the A350 and it starts again. Yep, only 50 behind in firm orders this year. Of course not counting MOIs. 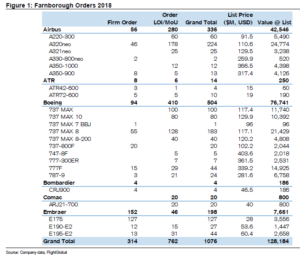 Looking at value of sales Boeing and Embraer are the clear winners. Interesting that the 34xA339’s from AirAsia-X not listed here. AB will have to work at the price/cost of the A220’s. Firm orders are the only thing of significance to me. LOIs and MOUs can wait till they have been firmed up. 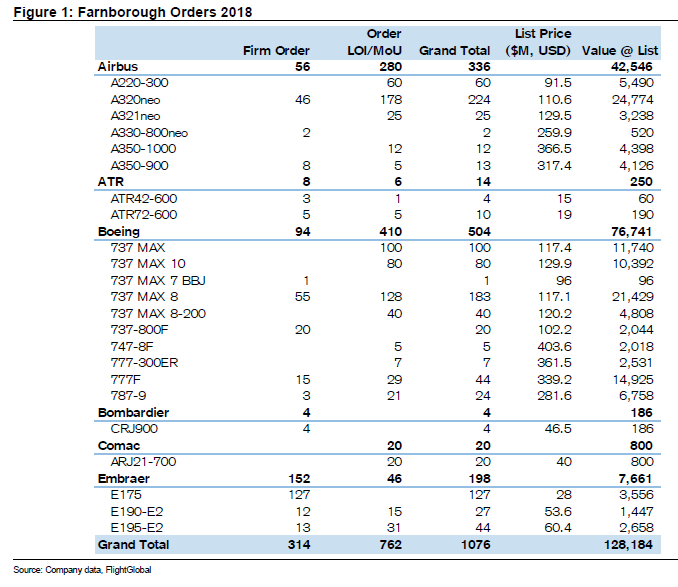 This year’s show has been quite a big disappointment seeing that neither Boeing nor Airbus made it into the triple digits on firm orders. I bet it has been quite a while since we last saw such a number at a Farnborough or Paris airshow. Agreed firm is what counts, the rest is fluff to be seen how it falls out. On the other hand, with the kind of backlogs they both have, why order something in 2025 when you have not a clue if Agent Orange has worked his magic and wrecked the world economy. It would be much better on the sales to list the reality of what it looks like even if you assume 40% discount on average its vastly closer than the so called list. It takes some real conjones to order things in advance these days, we could be right back to 1932 in a heartbeat. Some idea: Cost Max 10: List $129.9 mil; Fleet buy of around 10-12; $67.5 mil (@52% of list). Is that a giant slide rule behind you? Is it functional? Yeah! Probably not functional though, haha. Picture taken in the MechE building at UW-Madison. Air Asia is not even a LOI? What does FG know that we do not? Are we looking at reliable numbers? That’s the trouble with lists. Something somehow always gets left off. I sent a note to Credit Suisse. All I can see its a subsidiarity so far and that bodes ill.
Delta which is a good benchmark for sanity is taking 25 as I recall. This comment makes the 787 look increasingly desperate. And the aircraft shape is not a cargo shape, though I guess you could make a guished container that was oval. If you need a smaller cargo aircraft than a 757, then a 737 fits the bill. Well as I always say, stay tuned. Now Boeing has them hooked on the Max maybe they can stage the NSA with a 737max bridge. I do not see the Vietjet 50 A321NEO MoU either..
Engine offering now to include a variant with 52K Lbs of thrust. Right on the money for an AB Super Duper 60 response. An A321XLR MTOW 100-105T, ~180 pax, 4000-4500Nm, thrust 35-37Klb. The wing and fuel storage the big questions. Loading on the 2 wheel bogeys possibly becoming issues as is the max cruising speed with the current wing? So, 250 seats, 5000Nm the clear “gap”. Fuel storage on an A321XLR would not be an issue if a fully integrated rear centre fuel tank would be located in the lower fuselage, aft of the main landing gear bay — or just like it was done on the A340-500. Thanks for the link. Anticipated wing developments will be interesting. Sure PW can crank up the thrust of the 1100G to somewhere around 35-37Klb. Freighters (773F) came to the forefront this show. There is a big gap between the 767F and 777F, surely there must be scope for an 330-900F, especially if fuel prices moving North? Well no one wanted the A330F, so might as well try the A330-900 and see what happens. JBLU , The prominent customer of AB in America has published dismal results. Hope LN will analyse them. Since all other major American operators have published satisfactory results I wonder whether the poor results can be explained by the performance of their equipment. JB is seeing fuel prices go up and some routes have not proven out. There is a write off on the E190s they are going to dump. So it goes. In reality management and structure have far more to do with it than product. this was a voluntary strategic paper loss. they chose to take a huge impairment in full on the E-190s they are pushing out of the fleet “early” now so that it was a surprise and over rather than spreading it out over the next 10 quarters acting as a drag on earnings thereby minimizing the affect on stock price. this was wall street casino accounting 101. I am definitely not an accountant but will be interesting to see what jetBlue’s load factor was for Q2. Maybe David can explain a bit more why he suspects it could have to do with their equipment. DL, AA, Spirit, Alaska, Hawaiian are buying the same equipment, just like most global airlines these days. Maybe there is something to be learned. In the MAGA universe it’s seemingly unthinkable and incomprehensible that another OEM would ever be able to trump Lazy B. 1. I gave a list of failed European airlines who used only ( or almost only ) AB equipment. They were all respected with long history of operation . 2. Of the list keejse gave, only Spirit can be compared to JetBlue. The rest have much more diverse fleet , especially DL and AA. Spirit is due to report tomorrow . 3. In their After Earning Talk , JetBlue managers blamed mainly the rising fuel prices. The prices rose for all operators ( although some may fare better due to successful hedge ) but somehow not all were affected equally. Delta shares rose sharply after their report . Many still have to report, so the whole discussion is a bit premature. Now, in many cases AB equipment was found to be non efficient enough and this became apparent when fuel prices rose (A300, A340, A380 ). I just wonder whether this is the case again with the A320. 4. Airline is a very complicated business . I just don’t know how to measure and evaluate aircraft efficiency and it’s impact on it’s result. This sounds Boeing fanboy, an Airbus fanboy could say the same about Boeing. In many cases BA equipment was found to be non efficient enough and this became apparent when fuel prices rose (B707, B717, B720, B727, B747, B757, B767). I just wonder wether this is the case again with the B737, B777 and B787. Niether your statement nor the mirror reply make sense. Like TransWorld and Bilbo mention it’s mostly due to a write off on the estimated value of the E-190 fleet they have. Plenty of numbers available on the economics of Airbus, Boeing and other single aisle airplanes. Feel free to make the case of how having Airbus planes (vs having Boeing) leads to JetBlue’s “dismal numbers”. Julian – I don’t profess to be an expert on analysing airlines results. Recently LN have analysed in depth Norwegian reports. On my original post I expressed an hope they would also analyse JetBlue reports . I’m not sure how fuel prices relate to Jetblue equipment yet Norwegian are more an Boeing operator, does it work on that side too? Here’s a list of Airlines that went Bankrupt in recent years. I do not see a strong correlation to A fleets. Most had B fleets, but probably other factors were more important, in those cases.